When it’s 5F outside, always check the crankcase oil before starting the tractor, just in case it has turned the consistency of cold chocolate sauce. Just before the first big storm in this completely unholy string of snowstorms, the John Deere tractor decided that it was not going to start. 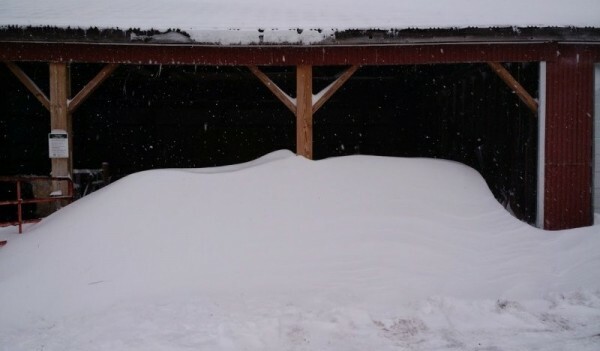 And so, in spite of the kind efforts of some neighbors and a mysterious stranger with a very large machine, the snow has really been piling up in front of the barn. Well, after a lot of head-scratching and a full complement of scraped knuckles, I finally got the tractor running again. Starter motor had finally given up the ghost after 40 years of service – a relatively simple and inexpensive fix once I finally figured out what the problem was. There’s really nothing like the sound of an old diesel motor turning over and roaring to life on a cold winter afternoon. And those fumes, those incredible fumes! That is the smell of victory, my friends. And just in time to get things cleared up a little bit before we get whacked with another foot of powder. 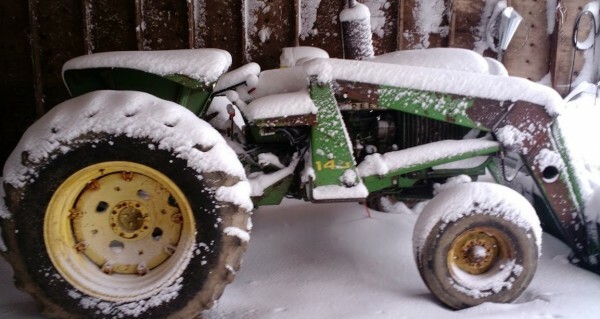 Let’s hope that the old tractor can push through the accumulated snow drifts deposited in front of the barn by a very crotchety Old Man Winter. Looks like we’ll finally have a snow free Monday, so we’ll be back in business at the Brigham Hill Community Barn. Hit the website to place your orders. It looks like more snow in the forecast, but we will have pickup this Monday, no matter the weather. We just wouldn’t be proper New Englanders if we let a little snow shut us down 2 weeks in a row. No way, not now, not never. There’s something crazy happening with our carrots. These familiar Red-cored Chantenay carrots are the same variety that we’ve grown for 4 years, and they are well-loved by many regular customers. One customer’s children will now only eat “farm carrots” – they are by far the coolest kids I’ve never met. Sometimes I think that people come to Monday pickup these days just to get carrots, and that it has nothing to do with wanting to say hi to their favorite farmer. It’s OK, I get it – these carrots are really good. And they’re getting better. Especially in the last couple of weeks, I’ve noticed the carrots have developed a more intense flavor. More fruity, reminiscent of a sweet red pepper. According to the FEDCO seed catalog, Red-cored Chantenay carrots get better in storage, but I’ve never really appreciated it before. Perhaps we just were never able to store them for quite so long. Whatever the case may be, there is something to be said for the joy of discovering the amazing flavor of fall-harvested heirloom carrots in February. This small pleasure, and a million others like it, are what’s missing from industrial supermarket food culture. As good as these carrots are, they won’t last forever where we are storing them. However, they will keep for many weeks in a plastic bag in your refrigerator, or in a similar cold dark place. Just keep the humidity high. Order 10 lbs or more for $1.25 / lb – this price won’t show in the shopping cart, but we’ll take care of it at pickup. If you have a good carrot recipe that you want to share, send it over – I want to start a recipe section on the website. I’m not sure exactly how much snow we got here in Grafton on Monday and Tuesday, but I’m guessing it was more than 30″ based on the record 34″ reported for Worcester. Reminded me a lot of the blizzard we had 2 years ago when we got about 30 inches of snow overnight. I think at some point, you can’t really tell – I mean, what’s another 6″ after you have 2 feet of snow and the wind isn’t about to let it stay where it fell anyway? I don’t a huge frame of reference, but it sure seems to me like these big storms are coming more often. How many of the top 10 biggest snowstorms in New England have happened in the last 20 years? It’s funny how storms like affect the landscape around the barn. The wind comes from north and northeast, whipping around the northwest barn corner and up over the roof. With light fluffy snow like you get in a cold storm, this actually keeps a section next to western outside wall of the barn (in the cows’ paddock) pretty clear. It also keeps the parking lot somewhat clear, while at the same time dumping huge piles of snow right in front of the barn. Check out the pictures to see what I mean. All the animals are good, though their world has shrunk quite a bit. The fence lines are buried, so I don’t really want to let the cows out into the field. Not that they would go out there, anyway – cows like hoofing it through 3 feet of snow just as much as we do. And Mattycat! What an amazing beast. I didn’t see him on Tuesday or Wednesday morning, so I was getting worried. But he magically reappeared Wednesday afternoon, ready for a meal. That makes 2 serious blizzards that he’s survived up on the hill. He must have 9 lives and then some. Those that know are being a little cagey about the forecast for Monday. We’ll plan to have pickup as usual, so get your orders in. Thanks!! I went up to feed the cows on Saturday afternoon, around 5:00pm. Normally, this is an incredibly unremarkable experience. Cows waiting impatiently in the barn for their dinner, bellowing at me as I get out of the truck. 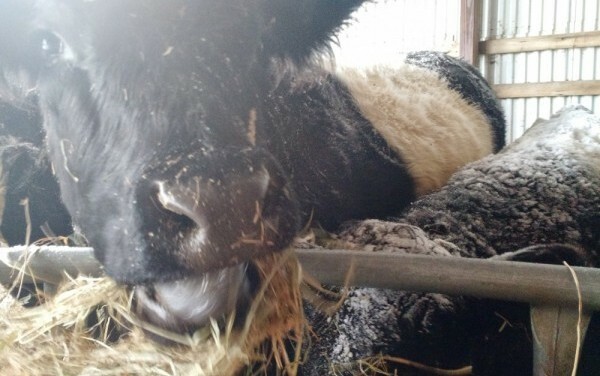 Hay in feeder, cows munch munch huff moo munch, back in truck, go home. However, this time, instead of cows waiting for me in the barn, I found the corral gate wide open, cows grazing in the neighbor’s yard like it was springtime, and other neighbor Zach waiting in the road looking a little unsure of what to do next. Apparently, one of the cows (I suspect Abigail) figured out how to unlatch the gate and they had been on a little mission around the neighborhood to find something green to eat. One of the neighbors, not having a lasso handy and unsure of what else to do, called the Grafton Police Department. The officer who came up the hill, presumably also lasso-less and not knowing what else to do, went to Zach’s house. And so Zach told the officer, “Oh, the cows are out? OK, thanks. Don’t worry, I work here, I’ll take care of it.” Nice! Anyway, Zach called Paul, Paul wrangled Dave, and I showed up just in time. After an hour of pursuit and cajoling, and after setting up some road blocks and temporary fencing, we got the cows back where they belong. And now there’s a chain on the gate. I’ve spent the last week tweaking and making small improvements to the new website. The home page now tells you the date that your order will be ready if you place an order, and this information is also displayed on the cart and checkout pages. I’ve made some small improvements to the shop pages so that I think it’s a bit more clear what you are actually ordering – a pound of this, a package of that, and how much an average package weighs. There’s a photos page that hooks right up to my Google Photos and Instagram accounts, so there will often be new farm pictures to look at. Well, mostly new Barley pictures, if I’m being honest. Finally the format of the newsletter is going to change a bit. You’ll still get the newsletter weekly, but it will contain a digest of blog posts made during the week. Note that you can order any time during the week and your order will be ready the following Monday – no need to wait until the weekend to place an order. I still request that you get your order in by Sunday night so I have time to get organized for Monday morning. If you place an order early in the week and then decide you need something else, just put in another order. It’s easy enough for me to put them together. Eventually, I plan to make it so you can edit your order during the week from your account page.